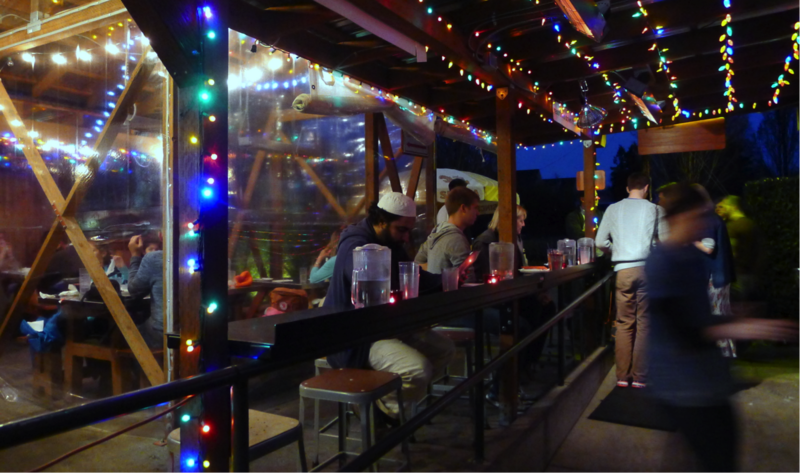 Pok Pok is an anomaly. It is one of the “most important” restaurants in its city (indeed, according to Bon Appetit magazine, in America)…but it is an unabashedly ethnic restaurant. 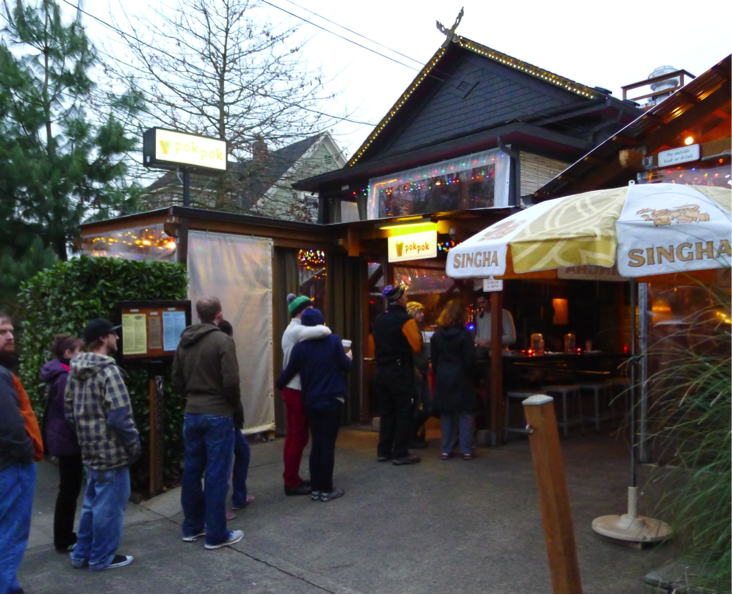 It is one of Portland’s highest profile restaurants…yet its food is served in little more than a glorified (but charming) shack that relatively recently did not feature heat. Its chef has won a James Beard Award and is celebrated for his creativity and influence…but has achieved that reputation by cooking within the bounds of an ethnic discipline. And then there is this: Pok Pok’s Thai food is highly authentic and not remotely dumbed down…but is cooked by that chef, Andy Ricker, even though he is not Thai in the least. One taste of the Papaya Pok Pok, though, and the anomalies began to make sense. This dish, the restaurant’s namesake, is one I’ve had before and made before…but not this well. Made it? Yes; but not with this sort of precision of flavor. 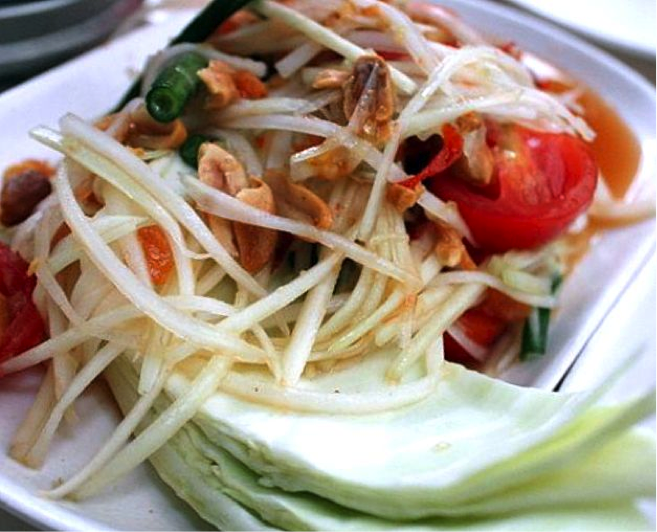 The essence of Thai cuisine – particularly Northern Thai — is a complete balance of spicy, sour, sweet, salty and bitter elements. This dish – indeed this meal – was a testament not only to that balance but to the precision with which each element was rendered, each portrayed. We followed the salad with three main courses we sampled family style. The first was Muu Paa Khan Whaam. Having heard (partly incorrectly) that the origins of Pok Pok’s cuisine lay in the street food of Thailand, high on my list on first read of the menu was this dish of grilled beast: specifically, grilled boar’s collar rubbed with garlic and spices and glazed with soy and sugar. It was, above all, a fun dish. Served with iced mustard greens and topped with a bracing sauce of chile, lime and garlic, it is enjoyable participatory eating: (1) grab some mustard greens (avoiding the ice), (2) scoop up some meat and sauce, (3) roll taco-style and (4) thusly deliver meat to mouth. Any dish that includes a boiled egg with a runny interior is going to be a dish I like. Pet Pha Lo was no exception. 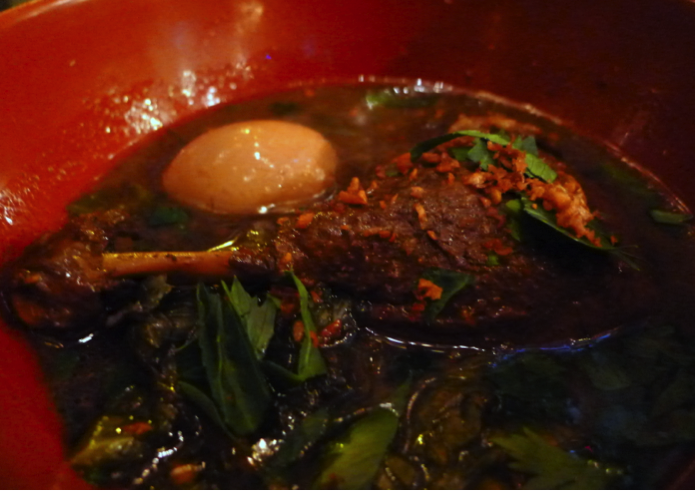 A duck leg stewed in a 5-spice broth with soy and pickled mustard greens was garnished with crispy garlic and brightened with vinegar. Like the salad this dish was a study in balance and contrasts: the soft-stewed duck meat playing off against the crispy garlic and the deep, earthy flavors of the duck and the egg against the vividness and umami of the broth. 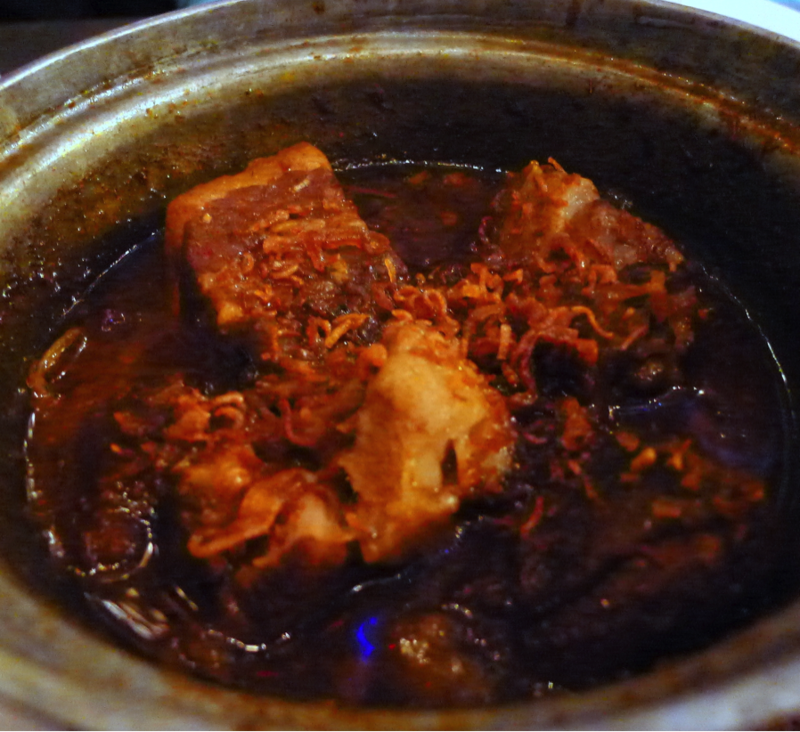 Our final dish was Kaeng Hung Leh, a Burmese-inflected sweet curry of pork belly and shoulder that is prominent in Northern Thailand. It is a wonderful summation of all that is Pok Pok. 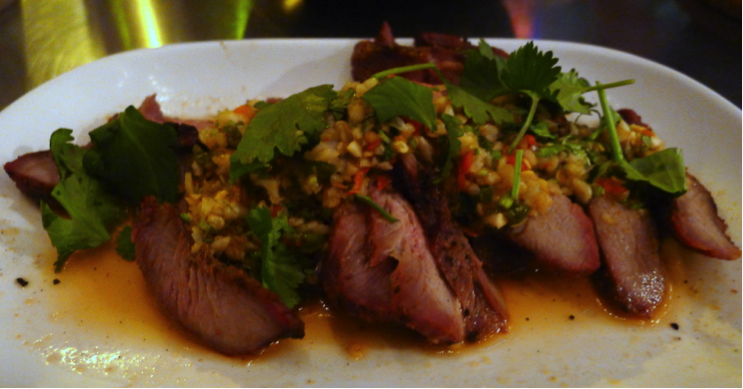 A deep track of Thai Cuisine that is, somehow, oh so courant. A dish featuring ingredients like pork belly, tamarind and pickled garlic would not be out of place on any New American menu. And yet, here it was as a purely authentic ethnic dish. So often the restaurant you’re looking forward to – the one with the big reputation, the one that just opened a New York branch, the one that seems a bit of an anomaly, the one with the long waiting times that does not take reservations for parties of less than five – is the one that disappoints. Not so this time. Anomaly? Yes. But an anomaly that is readily explainable by the plainly obvious quality of the food served at the welcome end of the line: the plate.